Many years ago I fell completely in love with the charm, fragrance and rich history of old roses. Even though I grow many modern roses, my heart strings are attached to the ones that have been around for a very long time and that give us an explosion of bloom in the late spring, filling our gardens with the wonderful fragrance by which all other roses are compared. Madam Isaac Pereire is a lovely Bourbon rose. Bourbons were the roses of Victoria England. The blooms are exquisite with a wonderful old rose fragrance. And, on occasion, you are rewarded with a few repeat blooms. Rosa Mundi is a Gallica rose–the oldest of the garden roses having been grown by the Greeks and Romans. 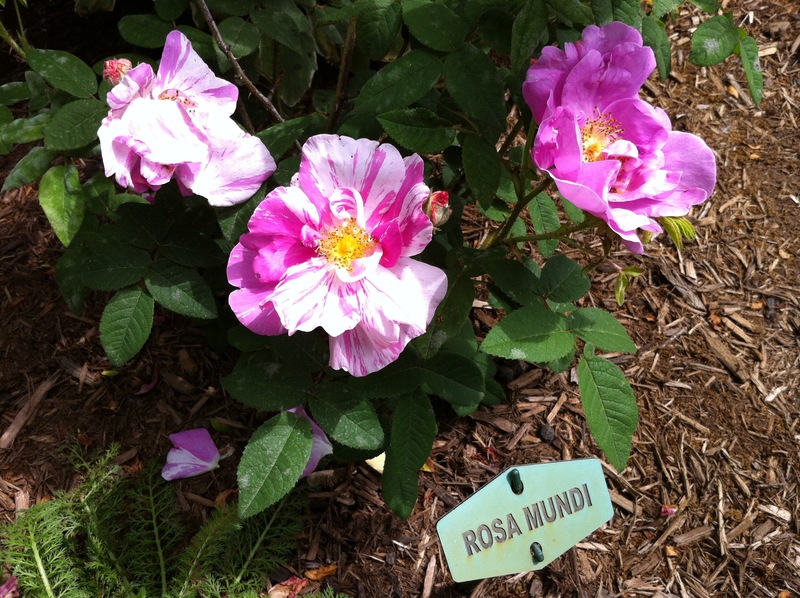 Not only is Rosa Mundi unique in that she is the first striped rose, she has a past. Legends tell us that she was named for Henry II’s mistress, Fair Rosamund, and was placed on her grave after his wife, Eleanor of Aquitaine, had her poisoned. Tsk Tsk. Regardless, she is a very unusual rose and very charming. Bourbon Queen is a Bourbon rose from France that dates back to 1834 and has been charming me since I bought her in 1990 at the Newburgh General Store in Newburgh, Indiana. She is highly scented and stunning to see. I so love to find out the history of plants, their origins and uses. Your roses are lovely! All are beautiful, but ‘Madame Hardy’ is a real standout! Awesome!